Do you like the challenge? Here is a selection of games that will test you your general culture: our selection of the best quiz games on Android! Duel Quiz is a bit the triple combo we all expected: it mixes varied general culture, speed and interactivity between players. You get hooked on it, but for once it does not matter: finally a game where, even when we can not stop, we continue to learn and train our brain. The principle is quite simple: you challenge a player (known or unknown) on 6 rounds, with 3 questions per round. Your opponent will have the same questions: to see who is the best! Duel Quiz is free to download, but the premium version (€ 8.99) allows you some additional options, such as being able to customize your avatar for example, and you mostly remove advertising. 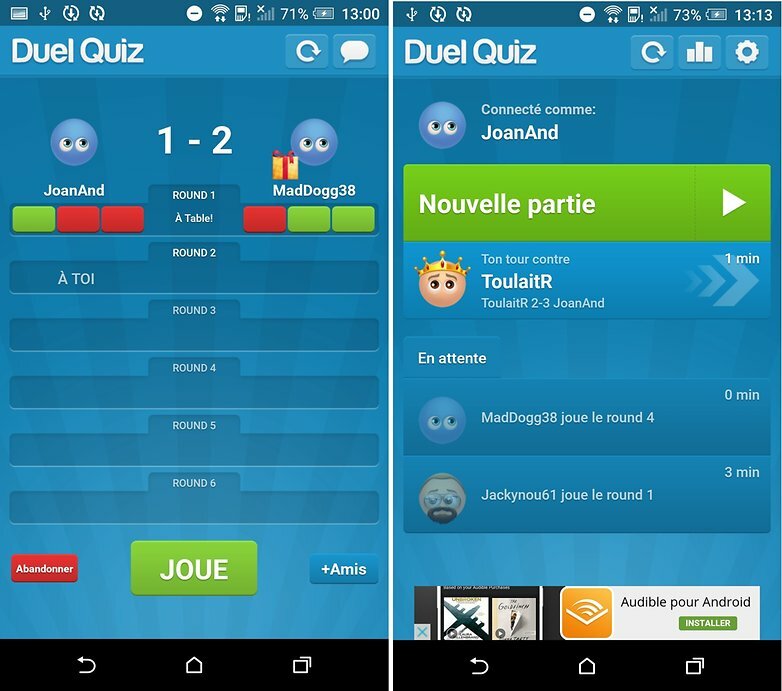 Quiz Up is the big competitor of Duel Quiz: the principle remains pretty much the same, except that your competitors can come from all over the world, which does not restrict the competition to Francophones. The only problem is that the questions have a certain tendency to move towards the USA, and little towards our country, but that does not matter! The interface is really successful and offers many game options. Quiz Up is free to download, and contains in-app purchases to speed up your rise in the game. The 94% game differs somewhat from the usual style of quizzes: instead of having the choice between several answers, you have to find 94% of the answers given. The goal is to be as complete as possible! Here are some examples of themes: first thing I do in the morning, we lack the time to do it, we play outside … The application can also offer you a joker in case of doubt. Here too, all the subjects are treated: history, botany, human body, geography … All in a nice interface accompanied by a playful music. 94% is free to download, but many in-app purchases are available. Just like 94%, Think is a game of general culture that hides behind original and poetic gameplay! The principle is simple, but the practice a little less: several symbols are displayed, and you will have to assemble them to find the sentence, the expression or the title of the final film! The funny thing about Think is that you dig up your imagination while working on our general culture, and the feeling of accomplishment at the end of each discovery is our reward. Only problem: English (almost) current is sometimes necessary. Highly French version! This time, it’s your musical culture that this quiz game will test! The idea is to find, from an extract, the name of the title or the artist of the song that includes it! If it sounds easy like that, you’ll see: even the biggest fans will have difficulties. A game to advise everyone who has a good memory, others: go your way, it will be too frustrating for you! Finally, his only fault is the strong presence of advertisements and the perpetual incentive to spend money.